Paddling pool, swimming pool, terraces, whirlpool, slide. It is the heart of the village, the place around which the sun revolves, the times when everyone arms themselves with courage for a holiday made of rest and distraction. 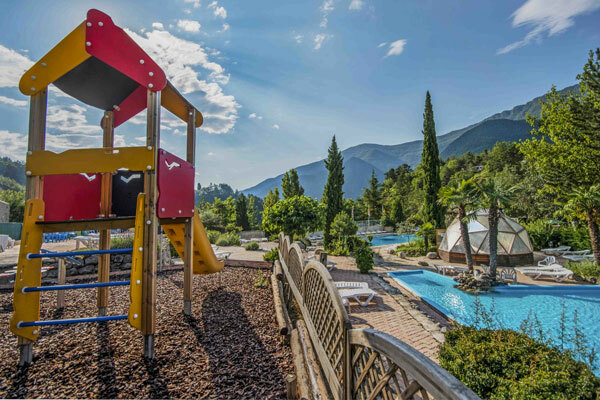 A heated outdoor pool for a refreshing swim in full sun, a paddling pool suitable for children’s games, slides for the bigger ones; the pools are at the heart of the village. 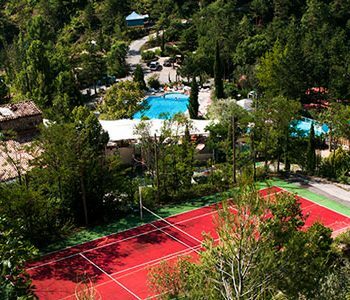 Whirlpools, a fitness place and numerous amenities (tennis, a petanque area, etc.…) complement large terraces, genuine small private beaches dedicated to idleness and rest. Our Pool area, facing South with views on nature en the restaurant below, offers the possibility for a refreshing dive. At nightfall, the lighting of the pools create an ambiance of quiet. Open all season from 9.00 to 20.00 to recharge your batteries and dive into a natural ambiance. 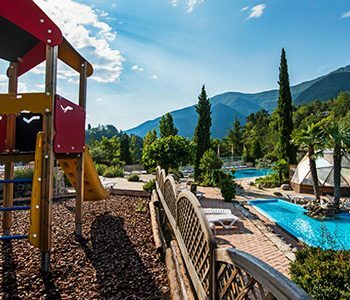 The40 cm deep paddling pool, and its water slide of 50 metres for every age, make up the playful and invigorating moments of Origan with a maximum security. Last but not least, the whirlpool heated to 35 degrees will definitely relax you while enjoying the view at the blue skies.